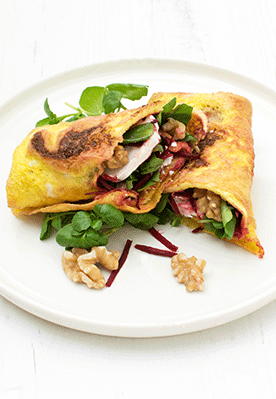 This omelette wrap makes a nice change from a traditional omelette or frittata. We love it with watercress, beetroot and goat's cheese but why not make it your own by adding your favourite fillings? 1. In a bowl, whisk the eggs with 1 tsp of vegetable oil for 1 minute. 2. Spray some oil at the bottom of a non-stick crepe pan. 3. Heat up the pan. When it is hot, add the egg mixture and tip it around the pan as you would do for pancake batter. You want the omelette as thin and even as possible. 4. Once one side is cooked, carefully flip with a spatula and cook the other side. 5. Place on a plate. Arrange watercress, grated beetroot, goat's cheese and walnuts in the middle leaving 2cm around the edges. Make sure you do not overload it otherwise it will be difficult to roll. Drizzle with olive oil and balsamic vinegar. Season to taste. 6. Wrap the omelette by folding the sides first and then rolling it onto itself.